At the beginning of the 60s elements of doo wop, gospel and R & B were coming together to form soul, and in this state of musical flux some records just seemed to fall between the cracks of these forms. 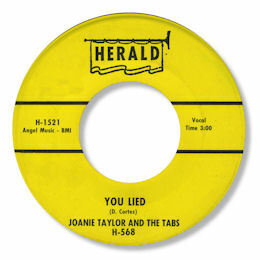 This fine ballad by Joanie Taylor is a case in point. Is You Lied doo wop? R & B? Or just what might be described as a classic "Birth Of Soul" song? Whatever the label though it is undoubtedly a real winner with some deliberate and careful vocals from Ms Taylor, nice background harmonies and strong arpeggio guitar. I love the blurting trombone deep in the mix but it is the excellent organ that holds it all together. And noticing the name of Dave "Baby" Cortez as the writer, that must be played by Mr Clowney himself.